I love to work with impassioned people. I love to play with impassioned people. And as a coach and as a mentor, I love to help impassioned people – maybe that’s you – to express yourSELF with your instrument. Whatever that instrument of expression is. For many of the people I work with – that instrument is the harp. 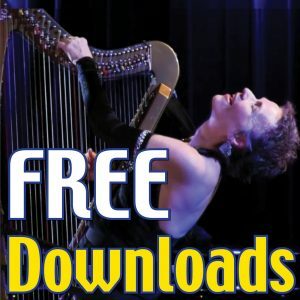 I find myself talking about passion a lot – often using those exact words above – as I remind myself and the people I’m with what part of them I’m speaking to, as I present online warmup workshops for my upcoming 10-Week program “Strings of Passion“, which is the first program of 2019 for my yearlong Hip Harp Academy. Class starts Jan. 15th, Doors close Jan. 21st – so there’s still time to register! If you’ve been in any of my classes, you’ve heard me say this over and over and over again, because that’s what’s so important to me. I’m not thinking about your technique. I don’t care how big your harp is or how big your hands are or how long you’ve played. I just care about your passion and your self-expression. That’s what’s important to me. But do we all know, do we all have that connection to that self? Do we know what that self is? Do we know how to make that connection? I was so moved by that because that is exactly what my “Strings of Passion” program is about. It is about finding the connection to that you, the authentic you, the you of your most pure artistic impulses – even if right now you think there’s nothing – or nobody – there. Because often we’re not aware of who we are and what we have to express … until we start exploring. Come explore with me in my 10-Week “Strings of Passion” program and discover that you that’s longing to be expressed. My 10-Week online program “Strings of Passion” is all about the principles and practices that turn creative impulse into creative expression. It’s about developing fluency and expressive richness in every area of artistic performance – including everyday life – and it’s about developing your own daily creative practice.